I know Christmas isn’t about things, but it’s also true that anyone who knows me knows that I love to give gifts. So that’s what I’m going to do this month… offer giveaways every week. Just because :-). 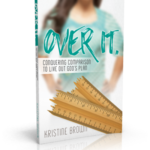 This week we’ll kick things off with a guest post from my awesome friend Kristine Brown. 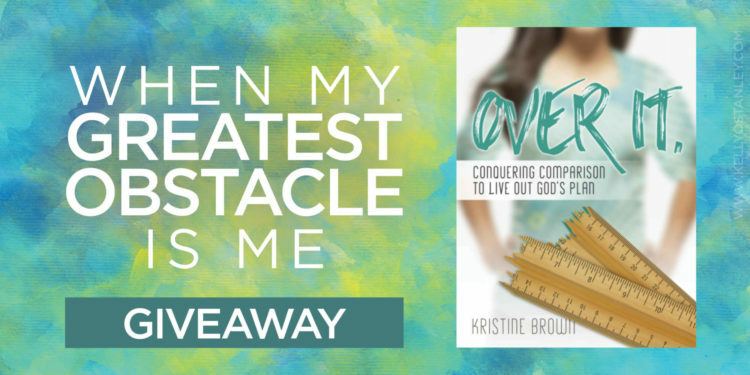 At the end, I’ll tell you how you can enter to have a chance to win a copy of her book. I stood on the other side of the auditorium door, just steps away from the moment that stirred in my heart just weeks before. I had seen the flyer advertising open auditions, and I wanted to be in the school play more than anything. There was just one small problem. This wasn’t a play. It was a musical, and I couldn’t sing. At least, that’s what someone told me once, and once was all it took for the words to stick. I thought I’d moved beyond that self-defeating thought. For the past three weeks, I’d planned and practiced a ballad taught to me by a family friend. A ballad I would be expected to sing by myself in front of total strangers. I committed to follow through, to open the door and step into whatever happened next. But now, so close to that moment, the doubt came flooding back like a raging storm set to destroy. I’d like to say I marched with confidence onto the stage and sang my heart out, not worrying about the outcome, but that wouldn’t be true. After staring at the back of that door for a few minutes more, I turned around, walked straight to my car, and drove home. I’d let myself become my greatest obstacle. Rhoda knew what it took to stop the ugly voice of doubt from invading her thoughts and causing her to lose confidence. Just a young girl, Rhoda served in the house of Mary. Many believers gathered there that night for a massive prayer meeting. Peter had been arrested by King Herod, and Christ’s faithful followers came together to pray for his safety. When Rhoda heard Peter’s voice on the other side of the door, she knew it was him. They’d been praying for his release all night, and God answered their prayer! No one in the house believed her, but that didn’t keep her from opening the door. From the actions of this innocent servant girl, we can learn an important truth. We stop words of doubt from invading our thoughts by insisting on God’s promises. Inside each one of us, there’s an unsure teenage girl still waiting behind the auditorium door. Every day we face circumstances where words from the past creep in and try to build an obstacle inside our very hearts. It’s hard to stay positive when negative words plant seeds of doubt, causing us to lose faith in what we know to be true. Rhoda’s story brings hope when we’re tempted to give in to self-defeat. So let’s join together today and insist on what God says to be true. We are worthy. We are loved. We believe. And with the promises of God in our hearts and minds, we become our biggest ally instead of our greatest obstacle. To enter a drawing to win a copy of this book, leave a comment below. Share with us one of God’s promises, a truth that you hold onto when times are rough. And then, if you would, pray for the person who commented before you. I’ll announce the winner next week. Praying for YOU is easy. I will carry your request to God, believing He can do anything. And that He will. You don’t deserve what you want. You haven’t been faithful enough. You haven’t trusted Him enough. He’s not going to come through for you, so don’t get your hopes up. It’s a form of self-flagellation at its worst. Beating myself up and living in the assurance that because of all of my failures, God, too, will fail. Or, at the very least, will fail to act. It’s a cruel torture that leaves a mark as surely as a whip would do. Many months ago, I found a lump in my breast. Instead of a regular mammogram, they scheduled me for a high-res, diagnostic ultrasound. I had to wait longer to get in. And I knew, I just knew, that the best thing I could hope for would be an assurance that “it’s probably nothing, but we need to do a biopsy.” I figured I’d have to schedule a procedure or two. And wait. And wait a little more. Instead of leaning on God, I snapped at my husband. Criticized everything in sight. And tried and tried to pray, but all I could manage was, “Dear Lord,” before I’d stop. Stumped. Afraid. Before I’d dwell on the fact that Mom died of cancer. That my dad had cancer. That my sister’s best friend died from breast cancer. That one in eight women will get it. And that there’s no reason in the world why that should not be me. As I sat in that waiting room, with the little pink shirt-gown on, while my technician prepared the machine, I couldn’t focus. And I was so afraid. Too afraid to really pray. And I let those words push away my fears. I let them drown out the what-ifs and oh-nos. It’s so easy to forget God is with us. That He. Is. Right. There. With. Us. No matter what we feel. No matter where we go. So I just kept repeating that chorus. Until I believed it. Felt it. Rested in it. After the ultrasound, the radiologist assured me that there is nothing there. It’s normal fibrous breast tissue. No cyst, no tumor. Nothing. I’m fine. I could have sighed with relief and moved on, like we often do, forgetting about it now that I’m past the scary part. But the situation got me thinking. I believe with all my heart in the power of prayer (so much so that I wrote a book about it). And if I still have my moments of doubt, if I still think that maybe God will come through for everyone else but not listen to me, then many of you probably feel that way, too. 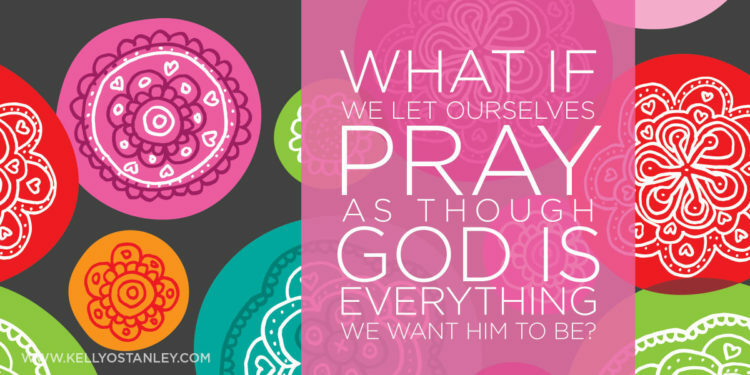 What if, just for today, we let ourselves pray as though God is everything we want Him to be? Everything that we think He is or should be? What if we prayed full of belief? What if we stopped torturing ourselves for our failings? What if God shows up? What if this is the moment when everything will change? What if I can summon as much faith for myself as I can summon for you? What miracles do you suppose we’d see? At some point soon, when things are official, I’ll be telling you about some exciting news regarding what I’m working on right now. But for now, suffice it to say that A) it is exciting news! and B) I am going to be extraordinarily busy the next couple of months. I’ll still post once or twice a week throughout the summer, but I’m going to supplement that by introducing some of my writer friends. Every Tuesday I’ll be sharing posts from someone new. I hope you enjoy and I hope these posts resonate with you. 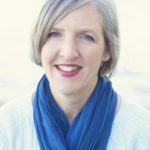 Check out their blogs if you feel so inclined… these kinds of guest posts have helped me find some of my favorite writers, so hope they do the same for you :-). Enjoy! Today I’m honored to share with you a post from my friend Debbie Wilson. If you enjoy it, check out her Bible study mentioned in the bio… someone you know got to design the book cover! My friend Suzanne often talks about the fiery darts that Satan shoots at us. We can’t stop the darts (of accusation, shame, temptation) from coming our way. But we do have a choice—to grab hold of these condemning thoughts and gnaw on them awhile, or to move aside and let them sail on past. Unpleasant memories will jump out at us from time to time. Temptation will come our way. We don’t have to feel guilt when the thoughts flash past—but it’s up to us not to catch them and carry them with us. We can certainly use the darts to our advantage, though, because knowing where we have been, where we are now, what we’ve carried, how far we’ve traveled, and what we’ve learned gives us the ability to pray with fervor and insight for another person. Time was ticking and I had to give my decision. I knew what I wanted. But every time I thought about saying, “no,” doubt assailed me. You’re wimping out. If you had faith you’d say yes. I thought my doubt was a nebulous feeling that sprang from uncertainty. But, I’ve learned some doubts have a diabolical side. What feels like paralyzing indecision may be a taunt from the enemy. Just like the devil gave King David the idea to take a census of Israel (1 Chronicles 21:1-3) and Ananias and Sapphira the idea to lie about a gift they gave to the church (Acts 5:3-5), he plants thoughts in our minds too. Jesus called the devil a liar (John 8:44) and the thief that comes only to steal, kill, and destroy (John 10:10). The Bible also says he’s a slanderer and accuser (Revelation 12:10). The better we know Jesus, the better we’re able to identify Satan’s influence. Have you received emails from friends asking you to send cash to help them because they lost their passports? I have. Even though the emails came from my friends’ accounts, the messages didn’t sound like them. I spotted the hoax because I knew my friends. The better we know someone the less likely we are to be hoodwinked by an impersonation. Jesus said His sheep hear His voice and follow Him. Below is an acronym to help you distinguish between the devil’s darts and your Shepherd’s leading. Protect yourself by learning to recognize the message or intent hidden in your doubts. Destructive: sent to rob and destroy. Their purpose is to draw us away from God’s good and satisfying will. They push us toward something we feel uneasy about by causing us to doubt the validity of our reservations. Or they pull us away from something good. You’ll offend your neighbor if you invite her to Bible study. Jesus’ words bring life and peace. Jesus never uses guilt, shame, or bullying to motivate us. Rule-oriented: relying on standards for righteousness instead of Jesus’ imputed righteousness. 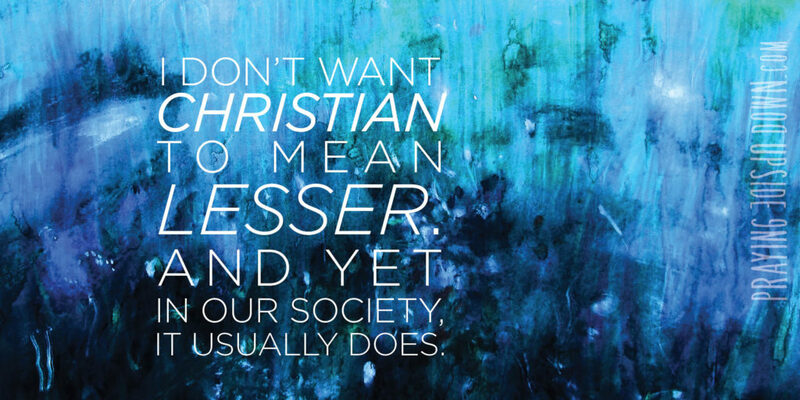 These thoughts tell us if we don’t obey their bullying command then we aren’t being loving or good Christians. For example: Good Christians must always… If you don’t help him how will he ever come to know Christ? Jesus reminds us that our righteousness is found in Christ, not in our performance. 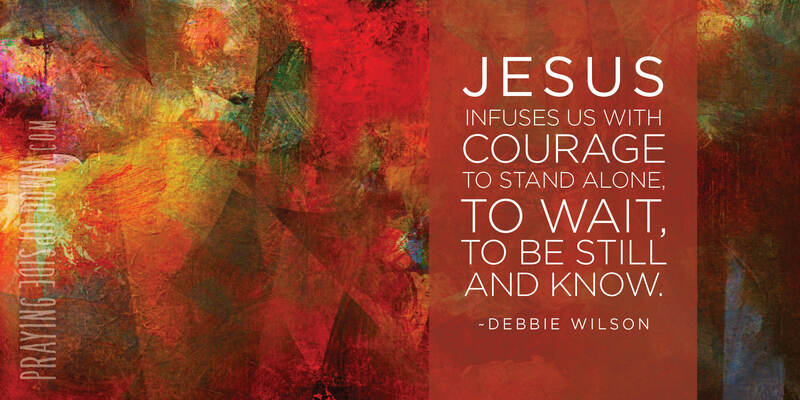 Jesus infuses us with courage to stand alone, to wait, to be still and know. Slanderous: maligning the character of God, other people, or yourself. God doesn’t care about you. Or, Your spouse is so stubborn. Jesus reminds us that He is with us, for us, interceding, and guiding. His Spirit bears witness with ours that we belong to Him and empowers us with love and patience. When God showed me the nature of my doubts, I was able to say “no,” with confidence. The next time you’re faced with confusion, ask yourself, “Is this legitimate doubt or a diabolical dart?” Then follow your Shepherd with confidence. Bio: Debbie W. Wilson is an ordinary woman who has experienced an extraordinary God. 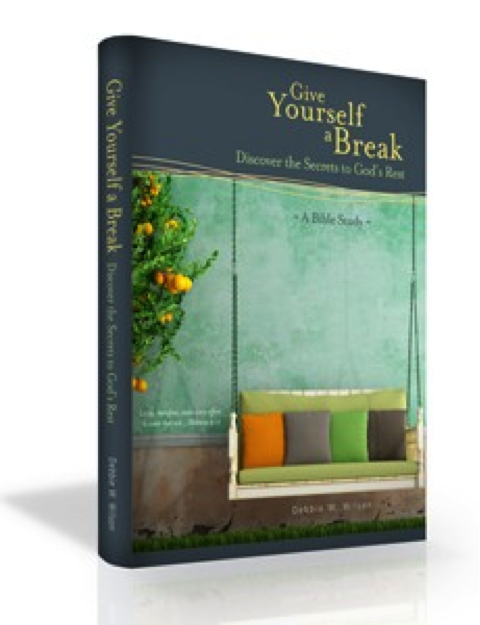 She is the author of Give Yourself a Break: Discover the Secrets to God’s Rest. Drawing from her personal walk with Christ, twenty-four years as a Christian counselor, and four decades as a Bible teacher, Debbie speaks and writes to help believers discover relevant faith. She and her husband, Larry, founded Lighthouse Ministries of Raleigh, NC in 1991. Visit her blog at www.debbiewwilson.com.